Social progress and sports are indelibly intertwined with American history. It’s why Jackie Robinson, who broke Major League Baseball’s color line in 1947, remains an iconic figure that transcends athletics. Pioneers open closed roads and minds. Their ground-breaking efforts, through meritocracy, spur momentum. 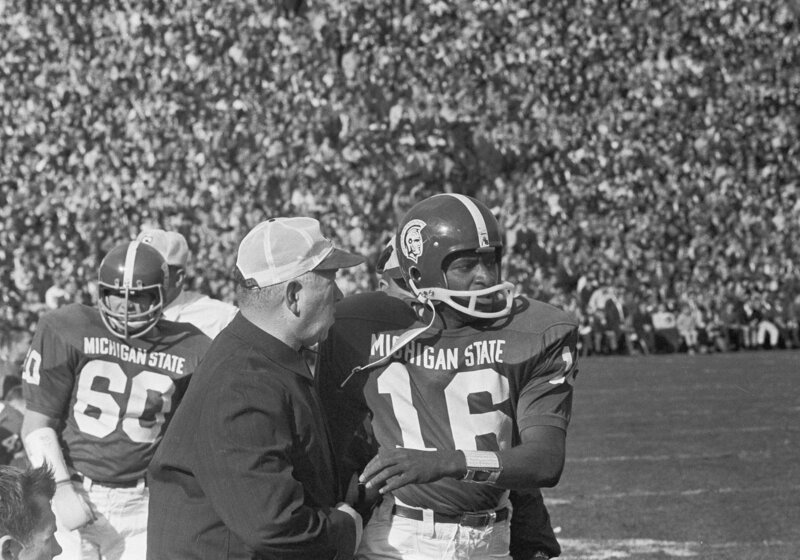 We’re reminded of this – at least in our Big Ten corner of the college football landscape – as pioneering quarterback Jimmy Raye enters Michigan State’s Hall of Fame this week. Raye and four others in the Class of 2018 -- Dale Anderson (wrestling), Savatheda (Fynes) Coke (track), Rachel Miller (rowing) and Bill Wehrwein (track) -- will be feted Thursday in a private dinner and honored on Saturday against the Central Michigan game at Spartan Stadium. Throughout Raye's playing and coaching careers he has dispelled racist myths -- first as the South's first black quarterback to win a college national title and later teaching as a college and pro coach. Oddly enough, the enshrinement of a black quarterback that grew up in segregated Fayetteville, N.C., is juxtaposed just a few days after an East Texas school superintendent revealed his racist thoughts in a public forum. Lynn Redden of Onalaska Independent School District criticized Houston Texans quarterback Deshaun Watson, an African-American. His comment, posted in the Houston Chronicle through facebook, was soon deleted. “You can’t count on a black quarterback,” wrote Redden, who on Saturday resigned his position that is supposed to be about mentoring and shaping young lives. The timing is disturbingly ironic with Raye’s impending moment, but maybe it also can be considered fitting. It teaches us how we’ve far we’ve progressed – many younger Americans don’t realize how recent was segregation -- at the same time we’re reminded we still have a long way to go. Let’s remember the Texas superintendent’s backward beliefs were once widely accepted. A half-century ago it was believed a black man couldn’t handle the pressure of playing quarterback, wasn’t smart enough to play the position and wasn’t respected enough to lead white teammates. But that was before men like Michigan State coach Duffy Daugherty and Minnesota coach Murray Warmath ignored racial stereotypes. In 1960, Minnesota quarterback Sandy Stephens was the first black quarterback to lead his team to a national title. Stephens, of Uniontown, Pa., became Raye’s inspiration once he saw him on TV at the Rose Bowl. Raye, in high school at the time, assumed Stephens was white until Stephens introduced himself; it wasn’t until then Raye realized a black man could earn a chance to play quarterback at a major college. By 1966, Raye joined Stephens in ground-breaking annals as the South’s first black quarterback to win a national title. That season Spartans and Notre Dame played to a 10-10 in their Game of the Century and finished with identical 9-0-1 records. The Associated Press and United Press International voted Notre Dame No. 1, but the National Football Foundation presented the McArthur Bowl, symbolic of its national title, to Michigan State and Notre Dame as co-champions. One day Daugherty showed Raye some of the hate mail he had received for starting a black quarterback. Raye went onto break more ground in the college and pro coaching professions. Daugherty hired him at Michigan State in 1972; San Francisco 49ers head coach Ken Meyer hired him in 1977. At the time, Raye was one of only seven black assistant coaches in the 28-team National Football League. By 1983, Raye was one of the first black coordinators when John Robinson hired him as his offensive coordinator with the Los Angeles Rams. Those 1966, 1977 and 1983 milestones weren’t that long ago, but they helped dispel myths if not the ignorance of Redden and his ilk. Polio is closer to be eradicated from the Earth than racism, an ill-bred human condition that infects too many minds. As President Obama often reminded us, history is not a straight line. It takes jagged steps as we lurch forward.